"Superb cinema verité style. It deftly portrays a spirit of hopefulness." "A dramatic feature [constructed] around the forbidden stories of an ensemble of outcasts should not be underestimated." The fringes of Iranian society can be a lonely place, especially if you are a teenage girl with few resources to fall back on. 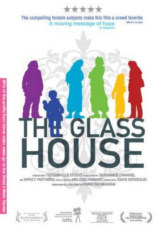 The Glass House follows four girls striving to pull themselves out of the margins by attending a one-of-kind rehabilitation center in uptown Tehran. Forget about the Iran that you’ve seen before. With a virtually invisible camera, the girls of The Glass House take us on a never-before-seen tour of the underclass of Iran with their brave and defiant stories: Samira struggles to overcome forced drug addiction; Mitra harnesses abandonment into her creative writing; Sussan teeters on a dangerous ledge after years of sexual abuse; and Nazila burgeons out of her hatred with her blazing rap music. This groundbreaking documentary reflects a side of Iran few have access to or paid attention to: a society lost to its traditions with nothing meaningful to replace them and a group of courageous women working to instill a sense of empowerment and hope into the minds and lives of otherwise discarded teenage girls. This film is available with a Digital Site License (DSL), which allows colleges, universities, or libraries to encode, locally host, and stream the film to their community on a closed, password-protected system. This film is available from AFD for public screenings and television broadcast. For information regarding rental rates and formats, please contact info@arabfilm.com for institutional/non-theatrical screenings, or info@arabfilm.com for theatrical, festival, television, or other bookings.